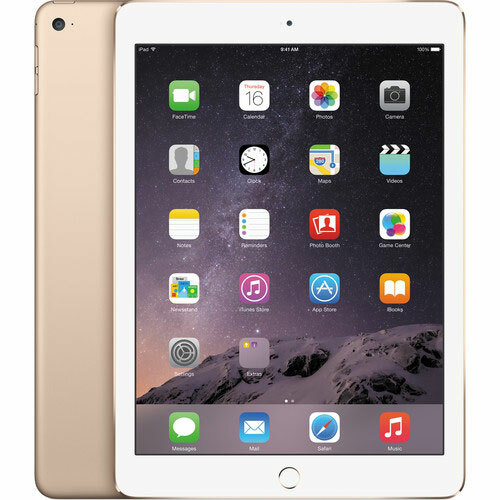 Work and play faster, thinner, and lighter with the gold 32GB iPad Air 2 from Apple. Featuring Apple’s 64-bit A8X chip and M8 coprocessor, the Air 2 delivers 40% faster CPU performance and 2.5 times the graphics performance when compared to its predecessor. It’s also 18% thinner at 0.24″ and weighs 0.96 lb. The LED-backlit 9.7″ 2048 x 1536 Retina IPS LCD display’s anti-reflective coating reduces glare by 56% and uses a single-layer design to eliminate internal reflectance for richer colors, greater contrast, and sharper images. Apple iPad Air 2 Wifi 32GB Space Grey is available for rent or hire from RENTaCAM Sydney.